Originally published in 1895 by R.C. Brown & Co., this is a modern reprint for Mechling Associates, Inc. Covers and inside pages are very nice and clean. Essentially as new and unread. 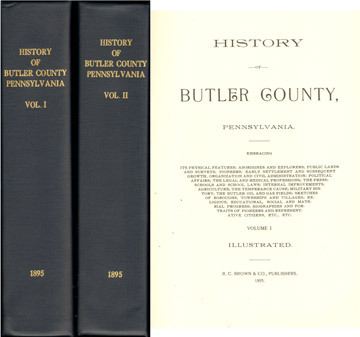 A detailed history of Butler County, Pennsylvania. Also included are biographies of many individuals and families. Hardbound, large, two heavy volumes, 1360 pages with index.